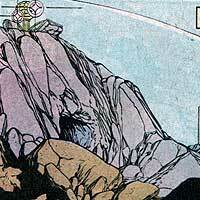 The Secret Sanctuary, located in Justice Mountain somewhere between Happy Harbor, Rhode Island, New York City, and Metropolis has long been the property of the JUSTICE LEAGUE. It was the first headquarters of the League and has been used by other heroic super teams over the years, including the DOOM PATROL and Young Justice. Booster Gold's first trip to the Secret Sanctuary with MAXWELL LORD was interrupted by the ROYAL FLUSH GANG. 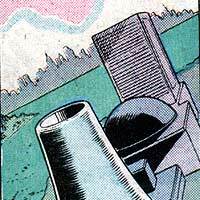 Even after the creation of the JUSTICE LEAGUE INTERNATIONAL EMBASSIES, Booster and the League would continue to make use of the hanger within Justice Mountain to house their large equipment and aircraft, including the flying Bug of BLUE BEETLE II. Dr. Jack Soo graduated from the Massachusetts Institute of Technology and found a job at S.T.A.R. LABS, eventually becoming Vice-President of Research and Development. DIRK DAVIS hired Soo away from S.T.A.R. Labs to become a technical director for BOOSTER GOLD INTERNATIONAL. Soo was responsible for the creation of the GOLDSTAR power suit, repairs to Booster's original costume, and introducing Booster Gold to RIP HUNTER. Ami Soon is a reporter for Metropolis' Channel Five news. 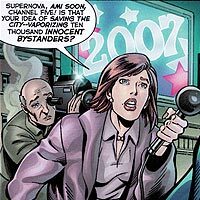 When news broke that Booster Gold had been hiring actors to impersonate villains in order to improve his public image (see MANTHRAX), Ami Soon was among the first reporters to begin accusing Booster of fraud. Soon continued her cynical ways by accusing SUPERNOVA of slaughtering thousands of Metropolis' citizens. 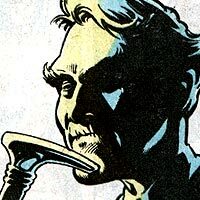 Soon follows in the footsteps of other reporters quick to call Booster Gold a fraud, such as Sam Carson of Metropolis Today and Cindy Mills and Quentin Fairacre of WGBS. Daily Planet reporter Ty Duffy never openly disrespected Booster Gold, but his reporting was generally dismissive of the positive aspects of super heroes interacting with the public. Rare are the reporters like Matt Olsen or Sherri Young of Entertainment Alive who glowingly report Booster's heroics, or even Connie Burnett~ who engaged Booster as professional commentator on her show Newstime A.M. with Connie Burnett. The Space Museum of Metropolis houses exhibits celebrating centuries of super heroic artifacts. After being expelled from Gotham University, Michael Jon Carter was hired by the Museum as a night watchmen. It was here that Booster first met Skeets I (see SKEETS) and hatched the idea to steal exhibits from the Museum and travel back through time to the 20th century to become a super hero. 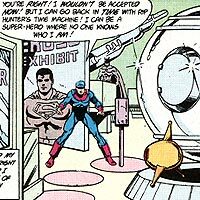 Booster Gold has revisited the Museum since his employment there, "borrowing" RIP HUNTER's Time Sphere on display a second time. Industrialist Simon Stagg is among the most successful men in America. His devious mind has driven his company, Stagg Industries, to a world powerhouse. Booster Gold first met Simon Stagg and his assistant Java while the JUSTICE LEAGUE was trying to save his European chemical plant from a plague-bearing mob engineered by former Stagg employee Irwin Teasdale. A short time later, Booster found himself leading the CONGLOMERATE, a team financed in part by Stagg Industries. Scientific and Technological Advanced Research Laboratories, commonly referred to by the acronym S.T.A.R. Labs, is the premiere scientific corporation in the world. Utilizing the highest quality scientists, S.T.A.R. Labs is a research organization devoted to the advancement of technology. With branches located throughout the world, S.T.A.R. Labs often works closely with the heroes of the world, as they often find themselves on the forefront of scientific endeavors. Booster Gold has cooperated with S.T.A.R. Labs since his earliest adventures against the 1000 and Mindancer (see DIRECTOR OF DEATH). S.T.A.R. 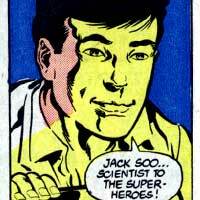 Labs technology and scientists (such as Doctor Klyburn and JACK SOO) have been invaluable to Booster, providing him and the JUSTICE LEAGUE with equipment and information. In Booster's return trips to the 25th century, S.T.A.R. Labs is seen to still maintain a Metropolis branch, proving that even well into the future, it will be a viable technological research organization.